"Pesto is the way a person makes pesto. 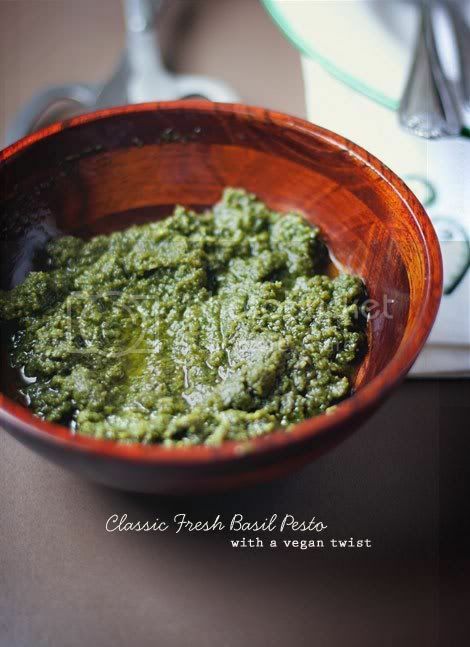 "* And if this is really the case, my definition of pesto is vegan, though it only swerves slightly off the path of the traditional, classic Ligurian sauce. Pesto is sort of synonymous with summer, so before the season draws to a close I wanted to do a beautiful, vegan pesto in a wonderfully rustic and hearty dish. I chose Trenette al Pesto. Veganizing pesto is easy — just substitute nutty, cheesy nutritional yeast (any brand will do, you can find it in health food and specialty stores), — and the sauce itself doesn't suffer much from a lack of cheese. But if you're lacto-ovo and totally opposed to losing the cheese, use parmigiano-reggiano in place of nutritional yeast in the following recipe. I've added two other seasonal ingredients to the dish that I picked up at my local greenmarket: haricots verts (French string beans) and new potatoes in three varieties to add color. You can use regular string beans and baby red potatoes if you can't find the other varieties or want to cut back on the price of ingredients. And if you find you need one, a great substitute for trenette pasta would be linguine or even fettuccine. 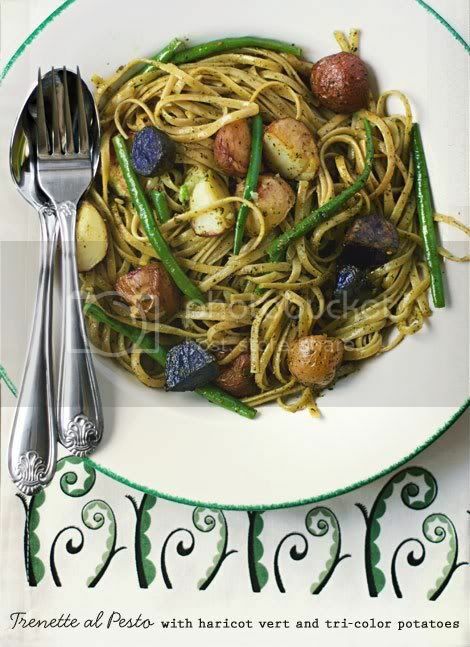 So when I made this recipe, I spent the day roasting potatoes, making pesto and cooking pasta, photographing things as I went along; and then I served my final dish to a small group of hungry peeps. My hungry peeps were of mixed omni and vegetarian company. And totally honestly? No one noticed that the meal was vegan. 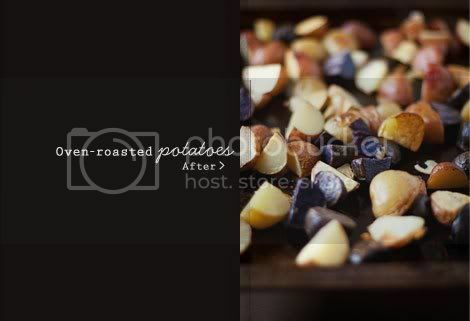 To start: Don't forget to roast your potatoes. You can get this started right before you make the pesto. I cubed mine, spread them out over a baking sheet and drizzled a generous helping of extra-virgin olive oil over top, then sprinkled with salt and pepper, and tossed everything together with my hands to get it all evenly coated. 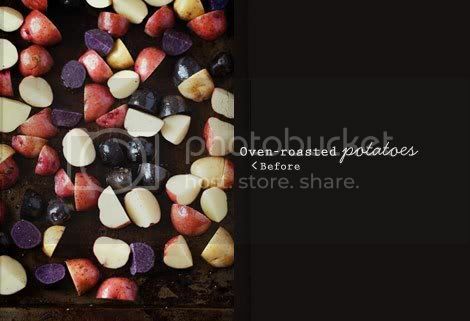 I roasted the potatoes at 475°F for 20 - 30 minutes, removing them from the oven and flipping them with a spatula a few times during cooking to make sure they got golden and crispy on all sides. Make the pesto: With the motor running, drop the garlic into a food processor to chop it (you can do this all in a high-powered blender, too, if you don't have a food processor). Turn off the food processor and add the basil, pine nuts and salt. Pulse until the basil and nuts are coarsely chopped, then process until finely chopped. With the motor still running, slowly drizzle in the olive oil. Turn off the food processor and transfer pesto to a small bowl. Stir in the nutritional yeast and set aside. Cook the pasta: Bring a 6-quart saucepan to a boil over high heat. Add 3 tablespoons sea salt or kosher salt. Drop in pasta and cook halfway, about 5 minutes. Add the haricots verts to the pot, and cook, stirring occasionally, until pasta is just al dente and vegetables are tender, about 3 - 4 minutes more. Drain the pasta and beans, reserving 1/4 cup cooking water, and return the pasta and beans to the empty cooking pot along with potatoes and pesto; toss to combine thoroughly, being careful not to smash the beans and potatoes, adding reserved cooking water by the tablespoon if needed. Serve family style in a large dish, and pair with a Sauvignon Blanc or a Zinfandel. Recipe adapted from Basil Pesto by Mario Batali, Food Network Magazine, May 2010; and Trenette al Pesto, Saveur magazine, Aug/Sept 2011. 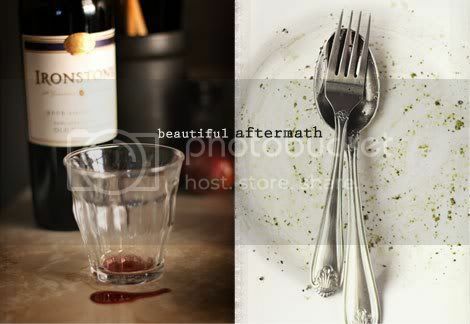 Photography, styling and design by Alyssa; photographs ©2011 Alyssa Yeager.